It is funny, in the late spring, when the grocery stores advertise their grilling recipes, as if grilling is somehow associated with summer. One of the reasons why Austin is the best city in the world is that it really is almost never too cold to grill. Just wear a jacket if it is chilly. Put on the patio light if has gotten dark early. The meat will still get done and it will still be delicious. Blue Eyes, Sparkles, Buttercup and I hiked Barton Creek, #4 Homedale Access, the other day. Well, we call it rock climbing instead of hiking, because Sparkles loves rock climbing, but not hiking. I chose this spot because it is as rocky as they come. For the 5+ crowd, there are areas full of boulders that make for a 3-dimensional hike. 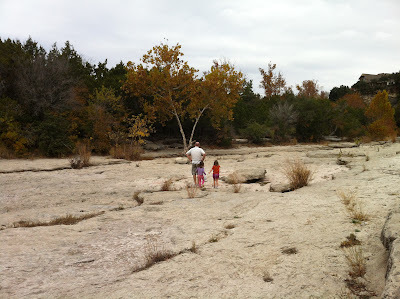 I especially like the curves and dips of the rock formations on the creek bed. I wonder why the rock is washed away by the water in some places and why it lasts forever in others. I also wonder about the plants that can grow in the rock, with the smallest amount of dirt for their roots to grow. As the holidays get more and more hectic, I’m going to remember to take a holiday hike now and then, to get away from the busy and remember the wonder. My Christmas Card Address List is like a friend I’ve known a while that changes over time and who tells me when that dress doesn’t really fit anymore, in case I hadn’t noticed. – Before Marraige/Kids – What list? What cards? Christmas cards are a quaint and old-fashioned tradition for old people. – Marriage – Well, I’m not too old, but I like being married and it is fun to send cards, so I’ll try it out. – Kids – OK, now I’m on my way to getting old. And I get it. Since I’m trying to manage these little kids running around, I don’t have time to visit with friends for hours at a time at a long afternoon happy hour. Except for my closest friends, the best I can do is remember how many kids they have (maybe their names) and if they still live in town or not. It’s nice to remember at least that much. It is nice to see couples move into nice houses and add to their families with brand new babies. – Kids Plus – This year, my relationship with my Christmas Card Address List took a turn and I feel older. I deleted names, and not just because we had lost touch, but because they had died, and not all of them were elderly grandparents who had lived a long and full life. Do you know how death feels different depending on the age of the person who died? For a child, it is always the greatest tragedy. For someone in their twenties, it is heart breaking. For someone in their thirties, it is unexpected. For someone in their forties, well, it isn’t that unusual anymore. I had one friend die who was born without functioning kidneys and was never expected to live to be a grown man. I had another friend die who was strong and healthy, but died within a week of discovering an advanced brain tumor. And besides the deaths, there was cancer, a stroke and a serious car accident that led to an amputated leg. I feel very mortal this year. The Christmas Card Address List showed this to me, in simple spreadsheet form, in case I hadn’t noticed. Merry Christmas everyone, a few days late. Happy New Year too, if I don’t see you before then.